Todos los cambios que ha introducido Google (ayudada por ASUS, que es el fabricante) en la edición 2013 de la tableta Nexus 7 son un acierto. Destacaría la resolución y nitidez de su pantalla, la buena relación prestaciones/autonomía de su micro y batería, y el hecho de que su formato sea muy cómodo de usar. Sin lugar a dudas me parece la mejor tableta de su categoría y por eso merece nuestro galardón de “Producto Recomendado”. Más hardware y muchos puntos débiles de la Nexus 7 de 2012 se han corregido y mejorado. La nueva tablet es para mí muy elegante, amplia de forma notable sus posibilidades y sigue siendo muy asequible. Le faltan aún el modo de 5GHz para el Wifi, o quizás Wifi-AC ya que nos ponemos a pedir, y un lápiz digital. Por lo demás debo decir que ASUS y Google volverán a tener un producto ganador en un segmento muy demandado que es del tablets ligeras y potentes que puedan ser utilizadas por toda la familia incluida una orientación cada vez más profesional. As much as the iPad Mini 3 is the clear winner in performance, do not underestimate the Nexus 7 and the Android ecosystem. Plainly put, if we shift focus to determine the winner in a bang-for-the-buck perspective, the Nexus 7 is the tablet to beat. Also important to note that many have invested heavily into either the iOS or Android ecosystems, I would always recommend leaning toward the tablet that is from the ecosystem you’ve previously invested in, unless you are in the mood for a new way of doing things. Android fans, be sure to check out the Nexus 9 if you want more horsepower. Now thinner, lighter and faster than 2012′s model, Google’s Nexus 7 brings an exemplary mix of power and portability in a 7-inch tablet format. It’s not an all-encompassing multimedia powerhouse, but the Nexus 7 really can’t be beaten on value if you’re after a compact and robust Android-powered tablet. The Google Nexus 7 (2013) is more expensive than the original but sees a small change in the design, while its exceptional screen and added rear camera help justify this price hike. It’s still lacking a microSD card slot but for many people with be the best 7in tablet around. If you're looking for a 7-inch tablet, I'll put it like this: there is no better alternative on the market, right now. And be aware of that qualification, because markets change very quickly. The Nexus 7 wipes the floor with the competition but Google could have worked at 100% rather than 97% to make the Nexus 7 the one to beat. The Nexus 7 is one of the best Android tablets available in the Indian market in terms of the overall user experience and build quality. However, its graphical performance was mediocre, and we did experience odd lags while playing heavy graphics games. Apart from this, the Nexus 7 (2013) tablet handled everything we threw at it with a degree of ease. If we had to mention other downsides to Nexus 7's complete package, they would be that the device tended to gobble up battery life quickly, and the limited storage (26GB user available). Our advice for power users will be to stay not too far from a charging point, as the Nexus 7 tablet tends to get below 40 percent battery within a few hours, which is disheartening. The Google Nexus 7 2013 costs £199 directly from Google for the 16GB, Wi-Fi only edition. That's £40 more than the previous model, but we feel the increase is justified based on the increased performance, sleeker design and vastly improved display. It's feels like a top-end device now, one which holds up well in comparison to the more expensive iPad Mini, and is very much deserving of our Best Buy award. If you're on a tighter budget, the £130 Asus MemoPad HD 7 carries on where the original Nexus 7 left off, but right now this is the best 7in Android tablet around. The 32GB LTE model is priced at Rs 27,999, which feels a bit expensive for a 7-inch Android tablet. However, when you compare it to Apple’s iPad mini with Retina at the same price, the LTE Nexus 7 offers better value as you get double the storage and LTE data too. Given these tablets were only just introduced into the market, the prices should drop in a couple of months. If you don’t need 3G, then the Wi-Fi only version is also a good pick as prices start at Rs 20,999. Compared to the 2012 Nexus 7, the new version has notable changes but honestly, the price difference does seem a lot. If it’s just gaming and casual web browsing you’re after, then then the old Nexus 7 is still a bargain for the price it’s retailing at. However, if reading eBooks and watching videos is something you do a lot, the new Nexus 7 is worth the premium. If you want simply a cheap, capable and unfussy tablet, the Memo Pad HD 7 remains a tempting bargain; if you’re in the market for something more elegant, more powerful and more future-proof, the new Nexus 7 is irresistible. The Kindle Fire HDX. It wins on the strength of its superior interface and software/content, though it excels in other matters, too. I found myself using the Fire HDX more often than the Nexus 7 to watch movies and to read on the train ride home. Its smaller size and convenient content carousel help guide you to exactly what you’re most likely to use a tablet for, without having to sift through a library of apps or spend hours setting it up. The HDX is also a keen choice for technologically challenged family members, as it offers better out-of-the-box functionality. If we disregard the confusion with the name, new Nexus 7 made a great impression on us. We would have liked for it to have a better design and to be made out of better materials and for its price to be the same as the predecessor’s at the time of presenting, but everything else is more than excellent. Although the Nexus 7 has only an average camera, no expandable storage and a selection of tablet apps that doesn’t quite cut it up against the iOS App Store, the device is still a superb choice. For just $220 you’re netting yourself a premium-quality system at an unbelievable price, making it hard to pass up for anyone looking at a portable, multimedia tablet. The Nexus 7’s screen bests every rival for pixel count and sheer quality. The components outstrip virtually everything out there – so performance is slick. The chassis is slimmer, lighter and more comfortable than before, and the 16GB and 32GB models cost less than £239. It'll also be first in line to get the Android 4.4 KitKat update. The new Nexus 7 once again redefines how much tablet you can expect for under two hundred quid, just as the original did. In every single measurable way the new model is a big step forward from the old, being smaller, lighter, more powerful and possessed of a much improved display. Despite one single niggle - there’s still no physical storage expansion - the Nexus 7 still easily deserves the title of the Best Tablet in the World. What you get for that premium, however, is a superlative piece of hardware. It’s the fastest, lightest, thinnest, narrowest, highest-DPI compact Android tablet – and because it’s a Nexus, you know the OS will be supported for the foreseeable future, while not getting bogged down by third-party “enhancements”. If you want a cheap and capable tablet, the Nook HD is still a tremendously tempting bargain. If you’re in the market for something more elegant, more capable and more future-proof, however, the new Nexus 7 is more or less irresistible. Summing up, we have to say we're impressed with the new Nexus 7. While it's not a milestone moment in Android's history in the same way its predecessor was, Google and Asus have made the right changes. Featuring improved performance, a new rear camera, amazing display and completely reworked design, the Nexus 7 2013 is currently the best tablet in its size and price bracket. In fact our only criticism is that, being released just one year after the first Nexus 7, which has also been upgraded to Android 4.3, individuals or firms that invested in the original own-brand Google tablet may not find enough vitally new features to justify upgrading. That said, for new users looking to try out an Android tablet, we couldn't recommend the new Nexus 7 enough. The Nexus 7 2013 is more expensive than the original but significant upgrades including the design, exceptional screen and added rear camera justify this. Despite still lacking a microSD card slot, it's the best 7in tablet around. 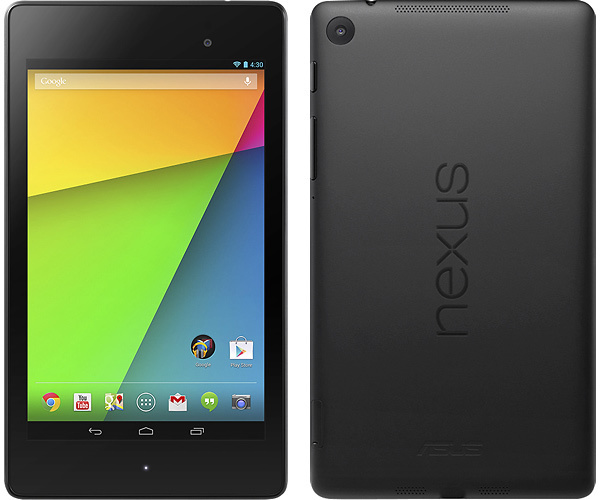 See also: New Google Nexus 7 2 UK release date, UK price and specs. The Google Nexus 7 (2013) is more expensive than the original but sees a small change in the design, while its exceptional screen and added rear camera help justify this price hike. It’s still lacking a microSD card slot but for many people with be the best 7in tablet around. We now await the challenge of the Apple iPad mini 2. If you're looking for a 7-inch tablet, we'll put it like this: there is no better alternative on the market, right now. If you're an Android fan, snap one up right away. But if you're on the fence, we definitely recommend holding off and waiting to see what the rumoured Retina iPad Mini or new Kindle Fire HD has to offer - though we doubt they'll give anywhere near as much value for money. Amazon Kindle Fire HD vs new Nexus 7 2 comparison review: Should I buy a Kindle Fire HD or new Nexus 7 2? There's no denying that (on paper) the new Nexus 7 2 is a all-round better tablet than the Amazon Kindle Fire HD. The only question you need to ask yourself is whether its worth the extra £50; we would suggest that it definitely is. Even with its slight price increase, the plethora of new features more than make up for the added base cost of the new Nexus 7. It is without a doubt the best overall tablet choice in the 7-inch market at this time. Its display and improved features make it an exceptional value. The obvious highlight of the 2013 Nexus 7 is the upgraded IPS display, which now boasts a 1920x1200 resolution. Far be it for us to downplay the hype, because as far as we're concerned, this is one of the best looking tablet displays available, if not the best around. Still, if you're considering a tablet now and are already dabbling in the Android ecosystem, we see know reason why shouldn't take the plunge with a Nexus 7. If you haven't invested at all with Android, you're still in a good place to start. You could wait and see about the next iPad mini, which is advisable for those who have racked up a lot of App Store purchases, but there's no way it'll be as affordable as the new Nexus 7. The somewhat half-hearted approach to tablet optimisation is a shame and a bit of an issue for the Google Nexus 7, and it's something that holds it back against the iPad Mini. Apple's little tab has endless apps tailored for its screen, and the squatter ratio and extra 0.9in make it more suitable for interaction and creating content. Should you buy the new Nexus 7? That depends. If you have last year’s model, you might want to hold out another year to see what else Google can cram into an affordable 7 inch tablet. But if you do decide to upgrade you’ll get a better screen, a faster processor, slightly longer battery life, and generally one of the best Android tablets released to date. The Nexus 7, available within weeks in the UK and already on sale in the US, is without doubt the ‘best of the rest’, and the most impressive Android tablet to date - as well as being a superb entertainment device. It’s still slightly crippled by a lack of decent killer apps, but in terms of hardware, at least, Google has shown it can match Apple, and actually improve on the iPad. The new Nexus 7 is poised to change the tablet game. It has a display and a price tag that puts the iPad mini to shame, and makes us wonder what's in store for the redesigned Nexus 10. Affordable price tags have bought the Nexus 7 some leeway, but it's no longer the dirt cheap option. Between Apple's premium iPads and Amazon's rock bottom Kindle Fire HD, is their room in the middle for a new Nexus 7? If you liked the original Google Nexus 7, you are going to fall in love with the new Google Nexus 7! The Google and ASUS partnership once again pulled it off and have married together some great hardware and software in this 7-inch tablet. The improvements were across the board too, so you get a much more refined user experience. At the end of the day it really all boils down to the user experience and that is stellar on this particular tablet. If you are looking for a 7-inch tablet, this is the new gold standard! The second-generation Nexus 7 offers strong features at an affordable price. If you’re a seasoned tablet user, whether you should buy this tablet will depend primarily on whether you are tied to Google’s ecosystem. Still, this particular device can hold its own against any other 7-inch tablet currently available. At the moment, it has some of the best specs, a bright screen, and a few other little goodies—and it’s hardly a splurge. If you’re in the market for a 7-inch Android device, this is the one to get. Google’s first Nexus 7 was cheap and cheerful. The second-generation version is just as keenly priced but doesn’t leave you feeling like you’ve made obvious compromises in return. That makes it our pick of the Android tablets, and sets an early – and impressive – challenge to the new iPad mini. Small tablets are most often used for some media, some gaming, some Web browsing, and some e-reading. Provided third-party developers update their apps for Android 4.3—and I think they will, soon—the new Nexus 7 is ideal for all of those, thanks to its sharp screen, comfortable ergonomics, and solid performance at an ideal price. That makes it our Editor's Choice for small tablets. The new Nexus 7 is everything a generational refresh should be – performance goes up dramatically, issues were fixed (storage), features were added (5 GHz WiFi, rear facing camera, Qi charging, high DPI display), and it’s all in a thinner and lighter form factor. The new Nexus 7 2013 doesn’t disappoint. We knew that it was coming, and that a few things were going to get better (1080p+ display), but it has exceeded our expectations. Besides the screen, the industrial design improvements and the overall responsiveness of the tablet are the most important changes from the first iteration. For those who want LTE, the ability to use 3 of the major U.S carriers with a single device is also extremely useful. A key battle in the small tablet market is the iPad mini vs Nexus 7. Well Google has announced the Nexus 7 2 so we see how it compares to the iPad mini in our comparison review. Nexus 7 (2013) : nouvelle reine des tablettes de 7 pouces ? 0.29 kg: Este peso es un poco alto para un smartphone. Los smartphones con una gran pantalla y pequeños tablets normalmente pesan casi lo mismo. 90.26%: No existen muchos modelos que sean evaluados mejor. La mayoría de las evaluaciones obtienen resultados que son un poco peores.